lilacmoon studio: blog: More small changes..
First of all, here is the inspiration for the small changes I've made to the bedroom. 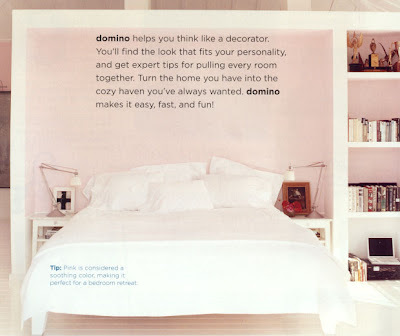 This image from Domino Magazine convinced me that I must get some task lamps for the bedside tables. And it got me lusting after the Archimoon table lamps at Room & Board, which look awfully like the ones pictured here. But since I can't afford them ($464! Each! ), I've opted for the Antifoni table lamps from Ikea. Not as beautiful as the Archimoon but it will do, right? 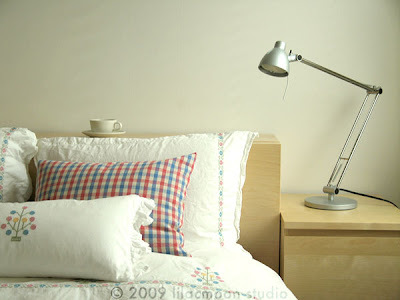 I also added more color to the room by making gingham cushion covers to match the bedding, with fabric from Etsy seller cottonblue. Now, some artwork above the bed and the room will be pretty much done! And have you seen the sneak peek of Office over at Design*Sponge? Love.